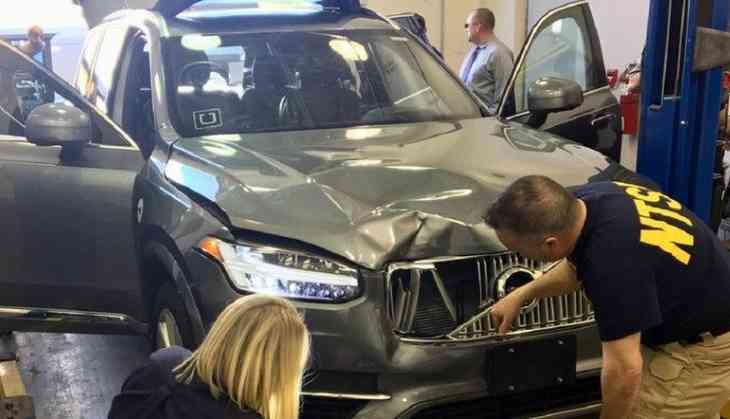 On Wednesday, police released a short video of a self-driving Volvo XC90 SUV operated by Uber which caused a death in Arizona. The collision took place between a Volvo XC90 SUV and a pedestrian, the investigators are now focusing on the safety of autonomous vehicles. The short video is from inside the Volvo XC90 SUV vehicle which was driving along a dark road, when an image of a woman walking a bicycle across the road suddenly appeared in the headlights. Also, the video shows self-driving vehicle travelling in the right-hand lane of a divided four-lane roadway, the headlight suddenly illuminated and focused on the woman. Elaine Herzberg, 49 died on th spot with several injuries. Police has released details about the accident which occured on Sunday night in Tempe, Arizona, a suburb of Phoenix. After, the incident Uber has suspended its autonomous testing vehicle in North America. The self-driving vehicles are designed to reduce the number of accidents and are designed to perform better than the human drivers but after the recent incident all the autonomous vehicles have been suspended in various states. On Tuesday, safety regulators released a photo which shows the damage on the right side of the vehicle. The video also shows vehicle's interior view, the driver appears to be looking down and not on the road. Suddenly, when the video stops the driver looks upward and is completely shocked. Uber in a statement said, “The video is disturbing and heartbreaking to watch, and our thoughts continue to be with Elaine’s loved ones. The cars remain grounded and we’re assisting local, state and federal authorities in any way we can."